The Italian most favourite coffee liqueur! a freshly brewed espresso coffee with nutty finish lingering milk chocolate. Yummy! 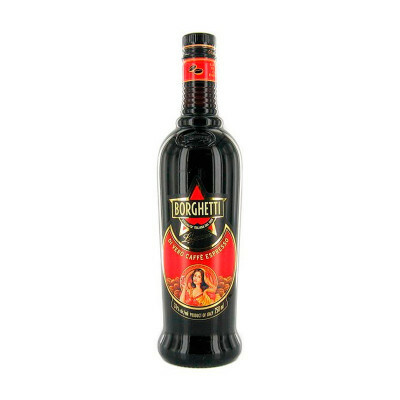 The best-selling coffee liqueur in Italy by far, Borghetti "a liqueur of real espresso coffee" is made with three separate and distinctive blends of arabica and robusta coffee, drawn from the three distinctive styles of coffee found in the various regions of Italy. The further you go north in Italy, the darker they roast their coffee: Branca sources its blend from 3 Italian suppliers, one in the North, one in the middle of the country and another in the South. The coffees are blend according to Borghetti's original recipe - steeped in grain alcohol, blended and sweetened with sgar. No coffee aromas, chocolate, extracts or distilled additives are added. Borghetti is simply flavoured with high quality roasted coffees and nothing else. Brand Fratelli Branca Distillerie S.r.l. It specially can be enjoined straight, on the rocks or as a mixer to enhance a variety of drinks and desserts.